During the Scottish Christmas Walk Weekend, hundreds of Scottish clansmen parade with their bagpipes through Old Town Alexandria. The family-friendly holiday event is a traditional favorite of the Northern Virginia community and a great day for visitors to spend the day exploring the charming historic town. In 1749, the city of Alexandria was officially established by three Scottish merchants and named after its original founder John Alexander, also of Scottish descent. Today, the city continues celebrating its heritage with a weekend of festivities including a tour of historic homes, a children’s tea party, a Celtic Concert and a Christmas Marketplace and Café. Alexandria's holiday events are among the best of the region, so be sure to mark your calendar. 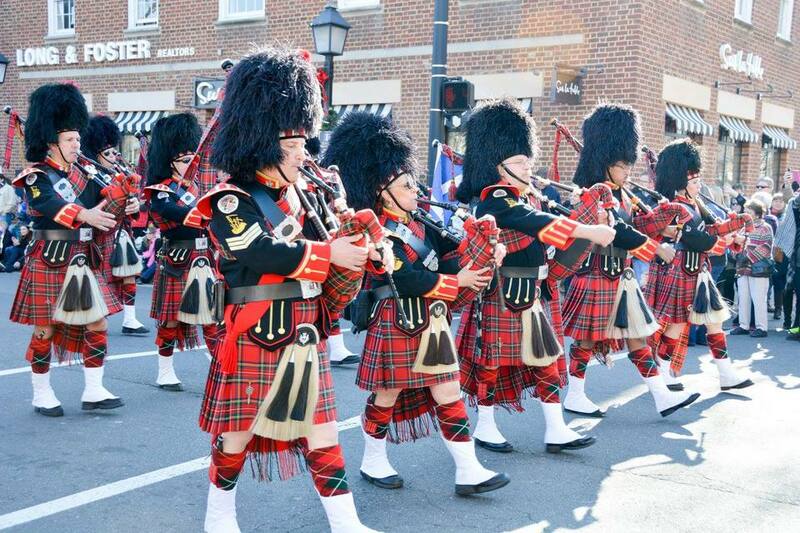 The Scottish Christmas Walk Weekend is one of the largest fundraising activities for the Campagna Center, a non-profit organization that serves children and families in need in Alexandria, Virginia. Campagna Center programs include Alexandria Head Start and Early Head Start; Campagna Kids, the Campagna Learning Center - Arlandria Project; Wright to Read, the Retired and Senior Volunteer Program and Building Better Futures. This popular event lets guest sample from a tasting menu of Scotches straight from Scottish distilleries and Scottish ales along with beer, wine and food. Parking is available at the Colonial Parking Garage on South Columbus Street. Be sure to collect your car before 10:30 p.m. or it will be locked in the garage overnight. Date & Time: November 30, 2018, 6:30 p.m. to 10:30 p.m.
Purchase holiday wreaths and garlands from the Campagna Center during the Scottish Christmas Walk weekend. Place an order online by November 23 and pick it up in person from the center. Date & Time: November 30 and December 1, 2018, 9 a.m. to 5 p.m. Hundreds of Scottish clansmen march through Old Town Alexandria with their bagpipes in a traditional holiday parade. Also participating are pipe and drum bands, Scottish dancers, re-enactment groups, Scottie dog groups, dignitaries and, of course, Santa Claus. Date & Time: Saturday, December 1, 2018 at 11:00 a.m. Rain or shine. This special annual event features a tour of historic Old Town Alexandria homes decorated for the holidays by acclaimed interior designers and local florists. Date & Time: Saturday, December 1, 2018. 12:30 p.m. to 4 p.m. Admission: Tickets are required. Advance Purchase - $40.